A good golf ball striker is a golfer that is consistent when it comes to hitting the ball straight.Getting tips to improve golf game is good on your journey to reduce your handicap. A golfer’s ball strike (if not executed properly) to a large extent is the major cause for most mis-hits. However, a good ball striking golfer scarcely has the problem of fat shots or thin shots.The fat shot is a shot that goes nowhere because the club hits the ground first, raising sod. It even puts the golfer’s wrist at risk of sustaining injuries not to mention the embarrassment it causes. Without consistent ball strike, shots will lack distance. Improving golf strike is an easy way to improve golf game quickly. It is a golf shot improver for sure. A lot of amateur golfers and beginners try to improve their beginner’s golf swing by hitting the ball hard. Sadly, exerting so much power to execute a swing won’t necessarily produce the right strike neither will it cover desired yardage.Most golfers focus on how to improve golf swing speed rather than paying attention to how to improve golf swing consistency. Don’t get me wrong. To improve golf shot consistency is one of the numerous ways to get better your overall golf game. And of course, gaining swing accuracy and power are also very important aspects to improve but the basic thing in my opinion is the improvement of ball strike. In as much as it is good to improve golf swing consistency and also improve golf shot accuracy, it is also expedient to improve ball strike consistency. You need to have a solid foundation on golfing. The basic rudiments of the game have to be at your finger- tips, if you are ever to improve any aspect of the game. How to improve golf skill?How do I improve my golf swing technique?What do I have to do to improve my golf game? These are some of the questions golf lovers with high handicap keep seeking answers to. They are important questions you must ask yourself if you must excel at your favourite sport. On the whole, improve golf swing technique and gaining sufficient mastery of your swing is needed for you to begin enjoying and lowering your score. For the proper golf swing technique see this golfing technique video. A good ball strike begins with the proper posture. If anything goes wrong with your posture during any stage of the swing, you can be sure it will affect your ball strike. A good posture will enable you keep your golf club on the correct swing plane in order to strike better. With your elbows securely tucked by your side and your hips slightly bent, address the ball. Also, you’ll need to keep your knees slightly bent at address. Maintain this posture while executing the swing.Nothing good comes easy and becoming a golf champ is no different. However there are some easy ways to improve golf score and help you improve your overall golf game. Working on your stance is one of the ways to improve your golf game. Get a good feel of your club grip before executing a strike. The club grip mustn’t be too tight or too loose to achieve a fluid strike. Hitting the ball with the sweet spot is what will send it to flight with the necessary precision and speed. If the club face shifts during the swing then there goes your solid strike. Perfecting your club grip and positioning the club face properly as the club makes impact with the ball is a sure golf swing improver. Keep your wrist movement at the barest minimum.Maintain good control of the club face. Be sure to leave the club face open during the downswing and square at impact. Then ensure that during the follow through, it stays closed. Practice ball positioning drilled that are aimed at improving your ball strike. This is where you practice proper alignment with respect to the target (ball). One golf swing improvement tips I recommend is that you adhere to the guideline on clubface positioning in order to maintain a constant ball position during the swing. Mis-hits are one resultant effect of lack of proper transfer of body mass from one foot to the other during the swing. If you lack the efficiency to coordinate your weight during the back swing, you will most likely have to compensate for that during the down swing. This is due to the shift in your core during the swing which causes the body to move away from the target line. Therefore, it’s necessary to discover how to improve golf swing plane. Club head rotation timing must be well calculated to avoid you rotating ahead of it. Don’t rush it, allowing above average percent of your weight rest on your right foot at setup then slowly transferring the rest of the weight during the swing is a pretty good way to better your ball strike. Most golfers shift during the swing for some reason and this affects their ball strike. Striking a solid ball requires the right kind of equipment. Being a good golf ball striker with the ability of consistently hitting the ball correctly requires adequate amount of practice as well as the right tools. Acquiring relevant materials is a fundamental part in the process of getting better strike. There a wide range of a golf training equipment to help meet your golf training needs. For instance, the golf swing plane training aids are specifically designed to help you fine tune your swing plane knowledge. Golf training aids for swing plane will aid you in perking up this aspect of the game. Whether you are a recreational golfer, a high handicap amateur or a beginner golfer, you need fitted clubs, and other golf accessories. 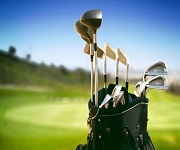 Golf equipment to get will be determined by your talent or skill level. As a beginner golfer, you should buy clubs with large sweet spot. As you progress, you’ll need the game improvement clubs. If you are using a club that is not well suited to your skill level, the effectiveness of your strike may be affected. Steer clear of players club till you start getting a handicap below 10. How to practice golf effectively won’t be such a far fetched idea if you are dedicated to practicing and better yet, if you have a workout/training routine. What you need to perfect your ball strike is a befitting workout plan and exercises to improve golf game. Have an expert golf swing trainer create workouts to improve golf game especially the strike. Each routine has its peculiarity, the correct golf training equipment can’t be done away with if you must improve your ball strike.It is also important for you not to neglect warm up exercises for golf. Each time you get on the golf course or driving range; don’t just start shooting balls, warm up for golf first. It’s one of the best way to improve golf game by the improving your strike.